Photo measuring slightly more than 4 x 7 inches. This is the second of four photos I bought this weekend. I’m going to try not to be lazy and post four baby pictures in a row, but I couldn’t resist this one. She’s just too cute. At first I thought the line in front of her feet was painted or chalked on the floor so she’d know where to stand. But when I enlarged the photo, I realized it marks the edge of a table she’s standing on. It’s hidden enough in the dark area of the photo that I didn’t notice it at first. That would explain why she looks like she’s trying to stay balanced. Bet some proud grandmother, aunt or other relative knit the coat and hat for her. Reminds me of the light blue coat and hat (complete with the little pom-pom on top) your grandmother knit for you. She is a cutie!! I’m sure that’s the case, and I’m sure that relative proudly displayed this picture. 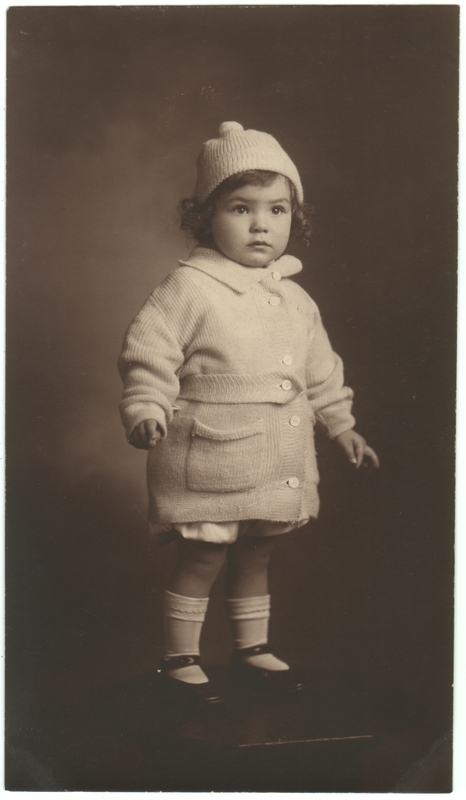 I love the knitted sweater…and the bloomers underneath! It’s hard not to. It was obviously a labor of love for a well-loved girl.